This coming Tuesday, April 26th, 7:30pm! 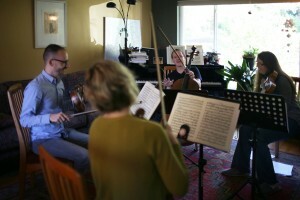 The Second Annual Call for Scores, presented by the Seattle Composers Alliance, in conjunction with the NOCCO String Quartet and the Wayward Music Series. Participants for the Seattle Composer Alliance’s Second Annual Call for Scores ranged geographically from the United Kingdom, Spain, Italy, Canada and beyond, as well as local contributions from Seattle and throughout the United States. Ten of the finalist’s pieces will be performed on April 26th by the NOCCO String Quartet, as a part of the Wayward Music Series at The Chapel at the Good Shepherd Center, starting at 7:30pm. At the end of this concert, a first, second, and third place winner will be announced from the stage. •First place winner will receive a 1-year Full Membership, a studio quality recording of their piece, and a free-invitation to participate in next year’s Call for Scores. Full Membership includes priority participation in “Fly Film Making” (Seattle International Film Festival) and other composing opportunities, priority registration for Film Meets Music networking events, discount entry fees to selected events throughout the year, reduced admission to SCA-sponsored events, free admission to SCA members-only networking nights, access to SCA members-only online articles, access to SCA members-only videos of select live events, project leads from the SCA Web site’s “Need a Composer?” request form. •Second and third place winners, in addition to the performance and recording, will receive 1-year Associate Memberships. Associate Membership includes reduced admission to SCA-sponsored events, free admission to SCA members-only networking nights, access to SCA members-only online articles, access to SCA members-only videos of select live events, project leads from the SCA website’s “Need a Composer?” request form. 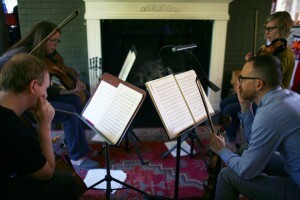 Photos of the NOCCO String Quartet rehearsing the for the upcoming concert! The Seattle Composers Alliance is a non-profit professional organization made up of working composers, students, and others interested in professional music composition. The SCA was created so that composers could gather with their peers in a relaxed, non-competitive atmosphere and share knowledge, experience and information. But we also have an agenda: special forums and seminars of interest to our members; expanding Seattle’s reputation as a center for musical creativity; and providing educational resources for composers in the Greater Seattle community. For more information about the Seattle Composers Alliance, please visit us online at seattlecomposers.org.